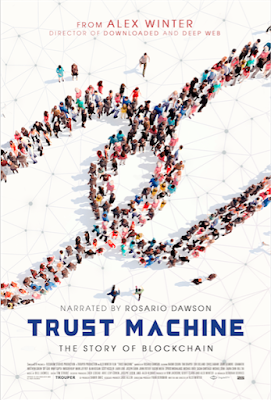 In his newest documentary "TRUST MACHINE: THE STORY OF BLOCKCHAIN," Alex Winter drills down on blockchain, the decentralized technology that supports cryptocurrencies. Why are banks terrified while UNICEF Ventures embraces it to help refugee children? Winter follows tech innovators striking a raw nerve as banks and network pundits rush to condemn volatile cryptocurrencies and blockchain technology. British hacktivist Lauri Love fights extradition—his computer skills perceived a threat to the US government. Through the film, Winter reveals that the proponents of the blockchain—a verified digital ledger—are already using the technology to change the world; fighting income inequality, the refugee crisis and world hunger. "TRUST MACHINE: THE STORY OF BLOCKCHAIN" opens October 26 in New York, and November 16 in Los Angeles. "TRUST MACHINE: THE STORY OF BLOCKCHAIN" is SingularDTV's first feature-length documentary release. Produced by Kim Jackson of SingularDTV, Geoff Clark of Futurism Studios and Alex Winter's Trouper Productions, the film is financed by SingularDTV, with Zach LeBeau, Arie Levy-Cohen, Alex Klokus and Joseph Lubin as executive producers.